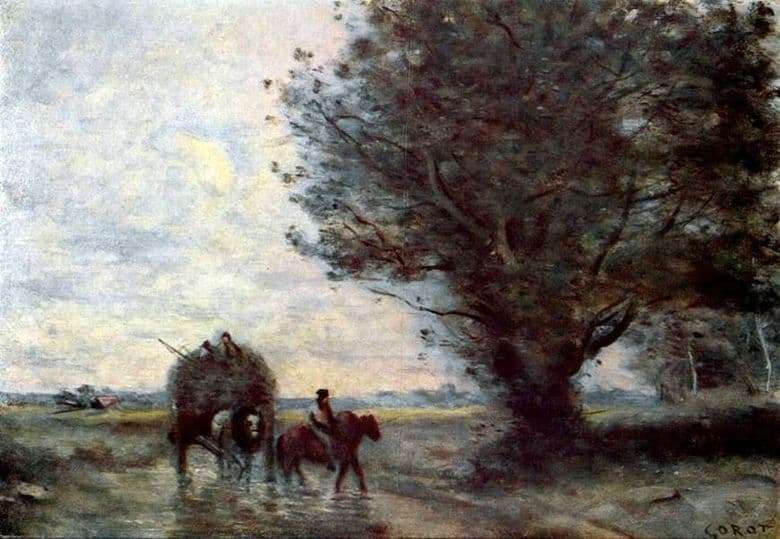 The painting “A cart of hay” was written in 1860. The basis of the picture was a canvas, made with oil technique, size 32×45 cm. At the moment, the picture is kept in the State Museum of Fine Arts. A. S. Pushkin, in the city of Moscow. During his creative life, the author has written more than two thousand paintings. Corot loved and revered nature very much. He works in the area of ​​the so-called national landscape, describing the nature of the area in which the simple people live their lives. The central place in his landscapes is occupied by people, however, the most important role is played by nature itself, many of his paintings describe the picturesqueness and beauty of nature. It is worth noting that when depicting Italian nature, he used ancient mythological characters. A masterpiece written during the heyday of the artist. Describes everyday activities, the center of the picture shows a wet road after rain in a field, along which a cart with hay rides. In this, the artist has looked into this poetic image. Drops from the rain just passed glitter and shimmer, giving the image romance. Rain-damped trees whose branches are fluttering from the wind, a wet road, a moving wagon with hay, rapidly moving clouds inspired the artist to create an image. The light strokes that paint the picture convey the dynamic and changing nature of nature, give lightness and lightness to the clouds, as if they float in the picture itself. The simplicity and at the same time the genius of the plot make the picture a special one, giving it romance.